Febrile Seizures. The discovery of the genes for fever-associated epilepsies was one of the most relevant milestones in epilepsy genetics. Discovery of the underlying genes including SCN1A, SCN1B and GABRG2 was tightly linked to the development of the Genetic/Generalized Epilepsy with Febrile Seizures Plus (GEFS+) concept, describing the spectrum of epilepsy phenotypes seen in families with these mutations. Gene discovery in GEFS+, however, has slowed down in recent years, and no further causative genes had been identified for more than a decade. Now, in a recent paper in Nature Genetics, mutations in STX1B are found as a novel cause for fever-associated epilepsies. Study by Schubert et al. 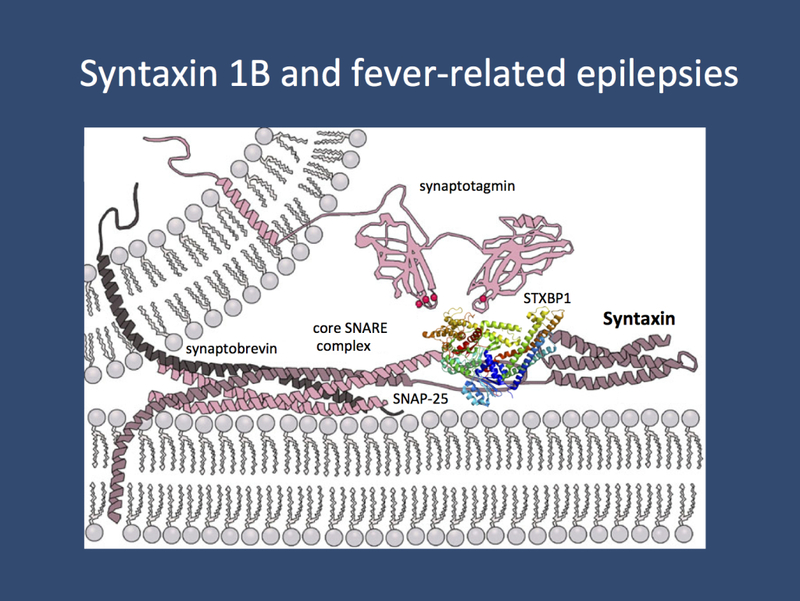 In the current study by Schubert and collaborators, we were able to identify different lines of evidence that suggest a role for STX1B, coding for syntaxin 1B, in fever-associated epilepsies. First, familial mutations were identified in two large pedigrees with febrile seizures and fever-related epilepsies. Interestingly, the evidence for STX1B dysfunction in a large family with febrile seizures and associated epilepsies was obtained through a threefold approach of linkage, exome sequencing and whole genome sequencing. An initial linkage screen suggested a region in chromosome 16p12, where the PRRT2 gene is located. Even though PRRT2 might have been a reasonable candidate, no mutation was identified. Subsequently, a mutation in STX1B was identified through exome sequencing of three individuals in this family. Finally, whole genome sequencing in six individuals of the core family was added to exclude other chromosomal regions segregating with the disease phenotype. There were none, and a truncating mutation in STX1B was the only variant found in this family. But what does STX1B do? Syntaxin 1B. STX1B codes for syntaxin 1B, a presynaptic protein involved in the release of presynaptic vesicles. It is one of the proteins involved in the triple helix of the minimal fusion machinery, an ingenious mechanism of our neurons to merge synaptic vesicles with the plasma membrane. Basically, our neurons have one basic problem when it comes to neurotransmitter release: neurotransmitters are stored in vesicles, which need to be fused with the plasma membrane. In the same way that it is difficult to fuse soap bubbles – you’ll probably end up with multiple small bubbles rather than a single big one – neurons need to find a way to overcome the resisting force when two membranes are fused. The minimal fusion machinery works like a little tightening screw that pulls the vesicle close to the membrane until the vesicle is fused with the plasma membrane. Genes coding for proteins involved in the presynaptic release machinery are increasingly recognized in epilepsies including STXBP1, DNM1, and SNAP25. Additional evidence. Schubert and collaborators identified a second family with febrile seizures-associated epilepsies and a mutation in STX1B. In addition, four additional individuals with fever-related epilepsies were found to have mutations or deletions in STX1B. These patients included two patients with Myoclonic Astatic Epilepsy (MAE, Doose Syndrome) with de novo alterations including a missense mutation and a microdeletion spanning STX1B. In summary, the genetic spectrum of STX1B-related epilepsies is reminiscent of SCN1A including autosomal dominant transmission of milder phenotypes and de novo mutations in more severe phenotypes. It will be interesting to see how the STX1B phenotypic spectrum develops in the future and to what extent it mirrors the phenotypic spectrum that is known in other Genetic/Generalized Epilepsies with Febrile Seizures Plus (GEFS+). Zebrafish studies. Using a similar approach that was used for the studies on CHD2 and SCN1A, the effect of STX1B deficiency was studied in zebrafish. When STX1B is knocked down in zebrafish larvae, the animals develop epileptic seizures. Intriguingly, these seizures were particularly sensitive to elevated temperatures. This may reflect the observation in humans to some extent where epilepsy phenotypes encompass a wide range of fever-related epilepsy syndromes including Febrile Seizures and Febrile Seizures Plus. It remains to be shown, however, how syntaxin dysfunction leads to seizures given the essential function of this protein in the presynapse. While it is too early to speculate about the underlying mechanisms, it should be added that syntaxin binding protein 1 encoded by STXBP1 is a direct interaction partner of syntaxin, suggesting common underlying pathomechanisms. What you need to know. Ever since the discovery of the major genes for familial fever-associated epilepsy syndromes including SCN1A, SCN1B and GABRG2, there was little progress in understanding the genetic basis of these familial conditions. STX1B is the first additional gene discovered in these conditions in over a decade. Unlike SCN1A, SCN1B and GABRG2, STX1B does not code for an ion channel, but for a presynaptic protein, adding to converging evidence that dysfunction of the presynaptic release machinery may be a key mechanism in genetic epilepsies. Disclaimer. I am a coauthor on the current publication by Schubert and collaborators. I usually add a brief disclaimer to blog posts that discuss publications that we are directly involved in to indicate that the blog post is not an outside evaluation of this publication, but a subjective commentary. Nature Genetics has also featured this publication in the Free Association blog. This entry was posted in 2014, Consortia, Epileptic encephalopathy, EuroEPINOMICS, Familial epilepsies and tagged Doose Syndrome, Febrile Seizures Plus, GABRG2, GEFS+, MAE, minimal fusion machinery, Myoclonic Astatic Epilepsy, neurotransmitter release, presynapse, SCN1A, SCN1B, SNAP-25, SNARE complex, soap bubbles, STX1A, STX1B, STXBP1, synaptic vesicle, synaptobrevin, synaptotagmin, syntaxin. Bookmark the permalink. I was interested to see that many of the genes that are continually associated with epilepsy are also associated with Autism. Re – ANK2, GRIN2B, DYRK1A, DSCAM, CHD2, SCN1A, SCN2A, SYNGAP1 and TBR1. I’d be interested in your thoughts about Autism and epilepsy ? I couldn’t agree more about the comorbidity of autism and epilepsy and many patients genotyped in the autism studies had in fact epilepsy as an additional feature. Both concepts are not mutually exclusive and therefore genetic causes overlap. In epilepsy studies, particularly when assessing epileptic encephalopathies, epilepsy is usually a very prominent feature, which is slightly different from autism with epilepsy as an additional feature. Epileptic encephalopathy is a less frequent feature in patients with autism compared to mild epilepsy that is frequently seen. However, even when this distinction is made, some genetic causes overlap.